Tim Tebow will start the season at Class A Columbia this April, the Mets announced on Monday. The former NFL quarterback will be assigned to New York's South Atlantic League affiliate next month when the Minor League season begins, according to Mets general manager Sandy Alderson. Tebow, an outfielder, hadn't played baseball since high school before signing with the Mets last September. "Sending him to a full season club is what we hoped to be able to do," Alderson told Newsday. "Based on what he's done in Spring Training, and his whole body of work since last fall, we feel comfortable with him going to Columbia." Tebow, 29, was expected to start the season either at Columbia or Class A Advanced St. Lucie. The Fireflies, who play in the capital city of South Carolina, are the Mets' lowest-level full-season Minor League affiliate. "We were concerned that it might be a stretch at some point, or could be a stretch," said Alderson. "But what he's done in Spring Training has convinced us that this is where he should go. And he's prepared for it." The 2007 Heisman Trophy winner was assigned to the Mets' Minor League camp in Spring Training but has been a frequent face at Major League games, where he's 4-for-17 (.235) in six games entering Monday. "He's fit in well with his teammates," Alderson said. "There hasn't been much in the way of criticism or jealousy or anything of that sort from his teammates. Again, that goes to what kind of a person he is." 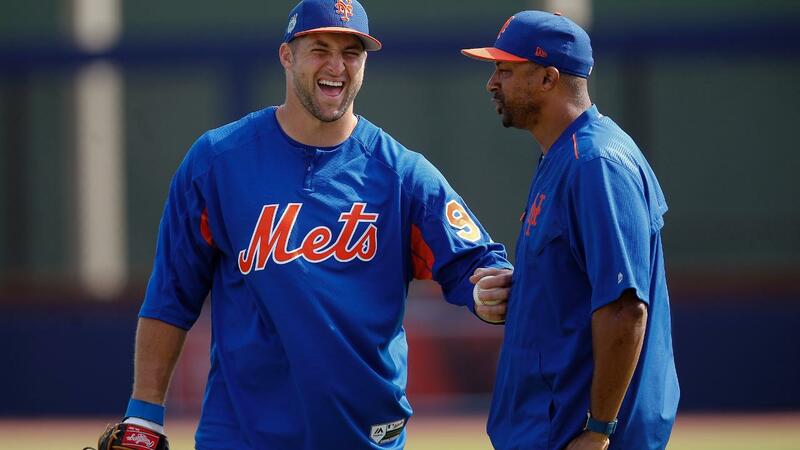 Mets manager Terry Collins has also had positive words for Tebow, praising the outfielder's work ethic this spring. "He's worked very hard, not only in the Minor Leagues but with our guys here," Collins told Newsday on Saturday. "We're here to try to help him get better." Tebow unlikely's transition began last fall when the Mets gave him a $100,000 signing bonus and sent him to instructional league workouts in Port St. Lucie. He then went to the prospect-laden Arizona Fall League and hit .194 with two RBIs and eight walks in 19 games. "Tim Tebow will bring major excitement and national attention to the Fireflies and city of Columbia," Fireflies president John Katz said in a statement. "Baseball fans, sports fans and Tim Tebow fans will likely come from around the southeast to see him play. We expect this to add to the energy at Spirit Communications Park and around downtown Columbia, especially during our opening weekend." Columbia opens the season at home on April 6 against the Augusta GreenJackets. The team's home games will be streamed live via MiLB.TV. Tebow's path forward is up to his performance and the Mets' desire to move him along. Collins has spoken this spring about the team's belief that Tebow should be facing higher competition in an effort to quicken his development. "He's going to have to adapt quickly," Collins said last week. "What he's attempting to do, not a lot of guys would even try. So I salute the fact that he's giving his best." Tebow was a first-round NFL Draft pick and led the Denver Broncos to the playoffs in 2011 thanks to a six-game winning streak. He was traded to the New York Jets in 2012 and later had brief contracts with the New England Patriots and Philadelphia Eagles before settling into a role with ESPN as a college football analyst. He most recently published his second book, Shaken, following an autobiography in 2011 that became a New York Times bestseller.